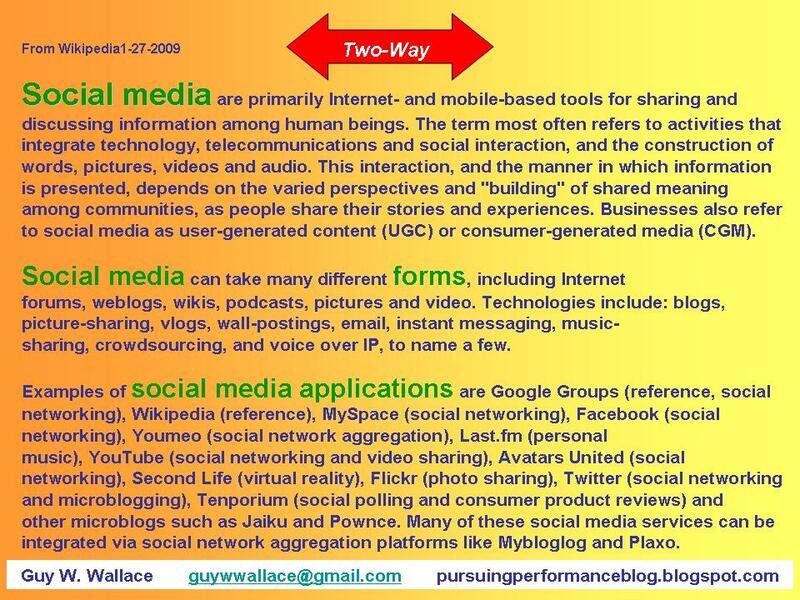 And depending on your idefinitions of INFORMAL LEARNING and SOCIAL LEARNING, Social Media as an enabling technology may play a large part, a small part, or a non-existent role/part in YOUR Learning Context. Or Contexts. Because of course, you may be involved in 2 or all 3 Learning Contexts in any one time-span. Maybe not at the moment. I did not grow up texting, haven’t really done a lot of texting since it has been available on my mobile phones over the past decade plus. I’ve been an adult since all that came about/became available, so I just made the phone call. And left a message if needed. No need to hide or be quiet. If I needed privacy – I went into my office or a conference room. Ever since I was a teenager – and ordered my own phone and phone line from Ma Bell in 1969 at my parents’ house – the voice-phone call, not the text message – was my Social Media/device. And the parents’ or my own car – with a tank of gas. I haven’t been texting with my social group or groups for most of my life. But many other have! I do my recent texting via Twitter and Facebook – experiments of mine to see what’s up. So Twitter didn’t automatically slide right into place in my top tools in terms of usage/time/mileage – and it did not replace something else. It layered on top. It augments. I am not driven to daily or hourly or moment-to-moment usage by my social needs to connect, to stay connected, to reconnect, and once disconnected to connect immediately with someone else – ASAP! Is it the ability to self-generate content that is the appeal? Everybody wants to know what I am doing – and I may want to know what they are doing/ thinking/ planning. So these are cool tools from the worlds of IT and miniaturization of electronics (thank you NASA!) – but in what way, what manner are these Learning Tools? 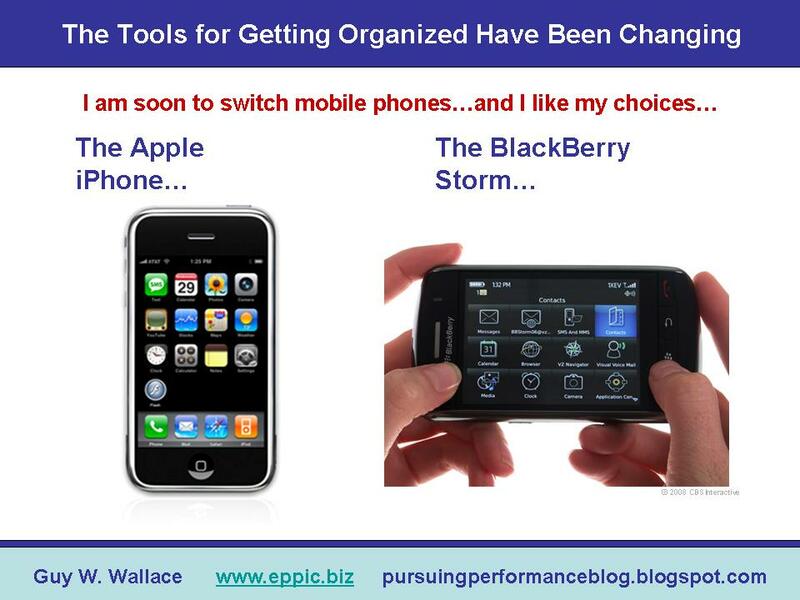 Besides being social tools – I see these more as Performance Tools than as Learning Tools. 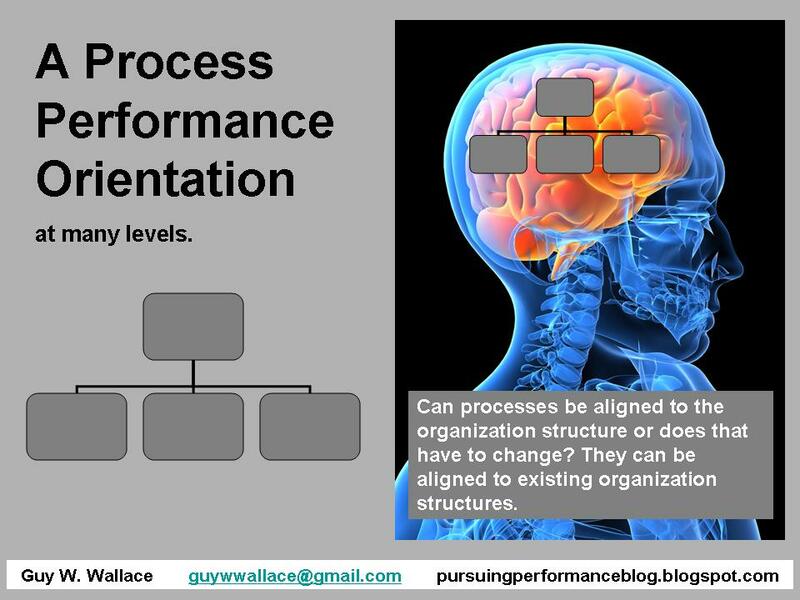 Performance Tools enable me to perform better- faster- cheaper! And I will learn from each use, just as I would have from the use of a wood router or a chain saw. 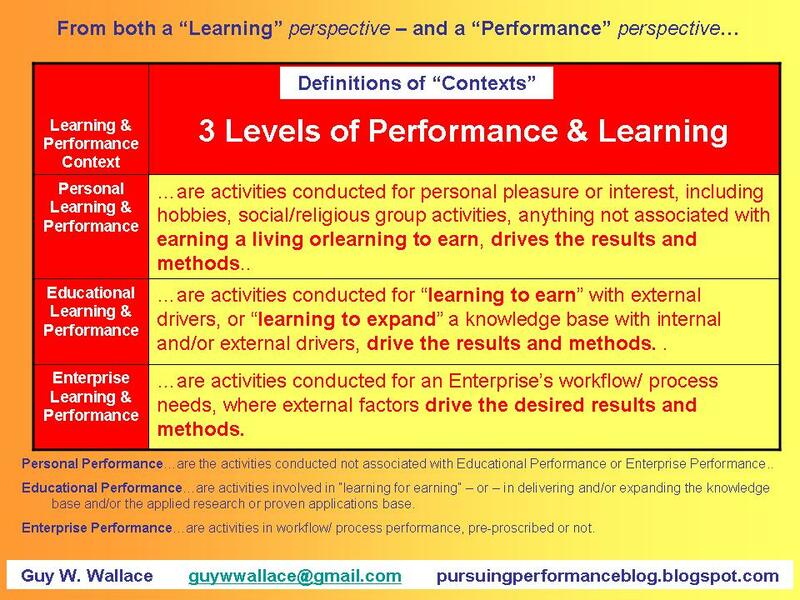 Personal Learning – Learning for personal interest – not to earn a living or to perform for someone else. Educational Learning – learning to earn and/or learning to expand the body of knowledge. Enterprise Learning – to perform in some defined or un-defined (or ill-defined) process or workflow. Which of these do Social Media and specifically Twitter and Facebook enable? That’s the chart for Learning. In Personal learning I can use them all. In Educational Learning I might be able to use various Social Media such as Blogs, Wikis, etc. But the utility of Twitter and Facebook is limited. I can use them to text/connect/communicate with teams, classmates, etc. Or to find people who know stuff. Or think they do. 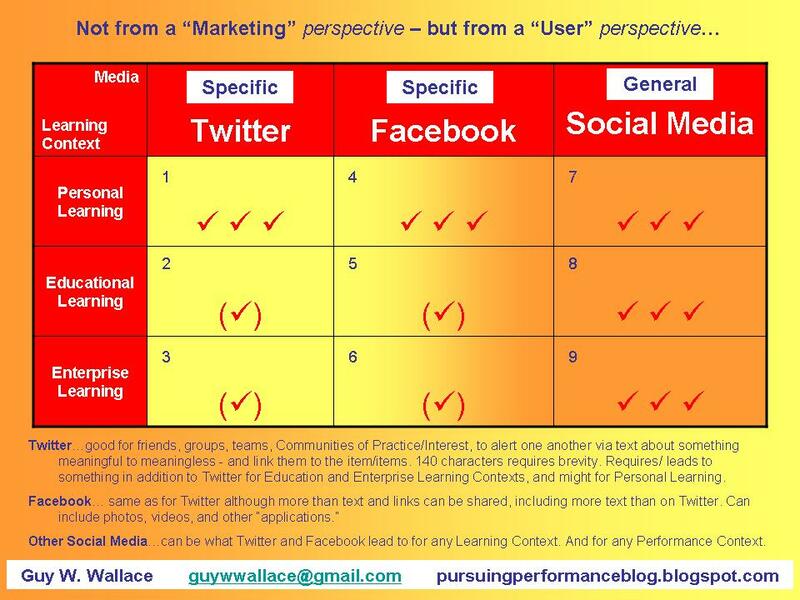 In Enterprise Learning as with Educational – the limits are the same for Twitter and Facebook, and the potentiality of other SM exists. 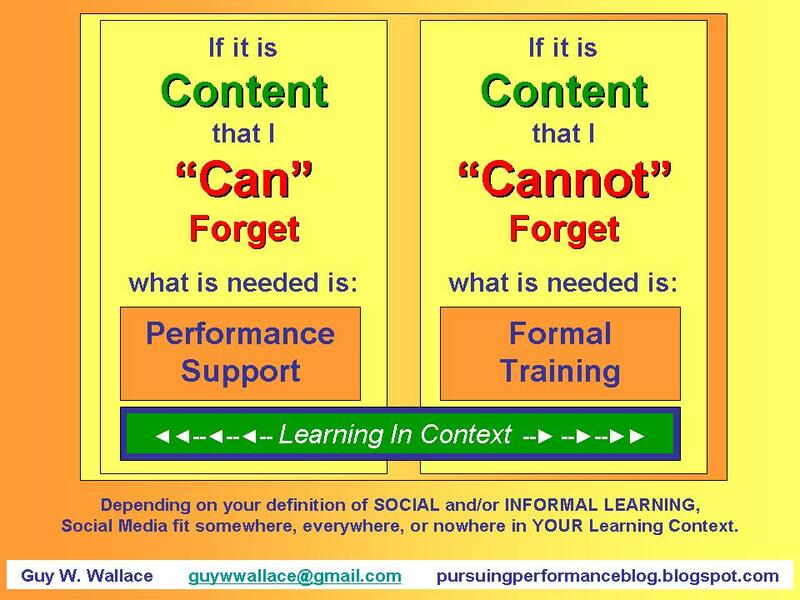 I think the utility and limitations are basically the same for both Learning and Performance Support. – I might not need to have remembered anything/ learned anything – other than how to source the answers to my questions. 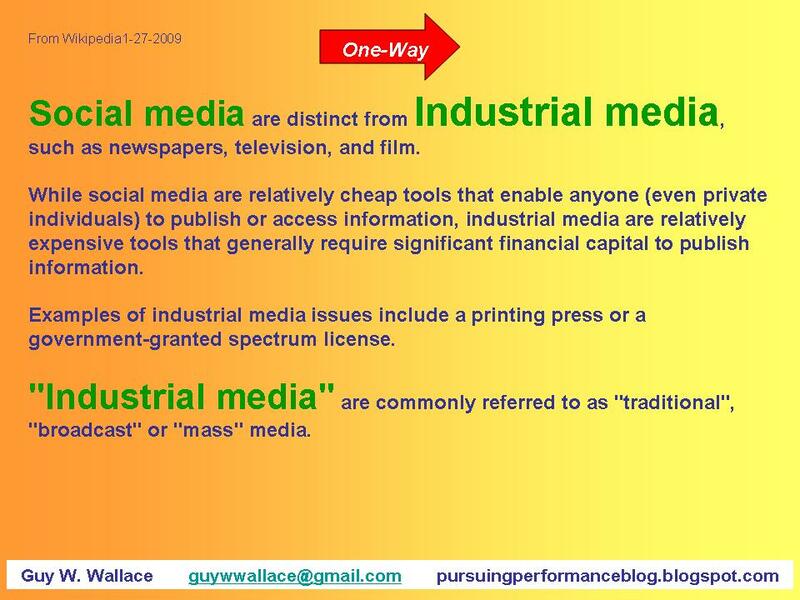 I think our profession’s labeling of almost all things Web 2.0 as “learning tools” versus as “performance supporttools” too often turns off the Enterprise leaders who need to “buy in” to the investments it takes in technology and tools.